I want to discuss three trading “truths” that I often heard but when I finally got into testing ideas found them to be myths. 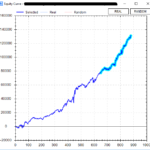 These discoveries were instrumental in turning my trading around. For those that know my story, it was not all roses and rainbows – what trading story is?!? I actually “learned” like a lot of traders from online sources, chat rooms, webinars, and eventually found the right circles to roam in after a LOT of trial and error. I was then lucky enough to land a job with a high frequency trading firm. I was quickly made to realized that much of what I thought trading “was” was most certainly false. In an attempt to show me the light, a few of the quick trading axioms they wanted to disprove to me were simple “well known” trading ideas that have been around for years but were in fact large falsehoods. I quickly realized beyond this list of three examples there must have been many, many more “trading truths” that were causing my account harm and doing my trading aspirations a disservice. I then realized the value in testing everything and quantifying my entire approach. It wasn’t until this point in my journey did I get out of the “rat race” of trading… the ups and downs, the barely consistent, always doing slightly better but not really getting anywhere trading most of the traders I meet today are going through. I cannot stress the importance of testing everything and quantifying your edge. Investigate these trading axioms. Otherwise you will be stuck in randomness until your account random walks to 0. For more on my journey check out this podcast I did chatwithtraders.com/103 Below you will find my three favorite trading “truths” quantified. This one is great because many are familiar with Japanese candle stick patterns and the name implies such a negative move in price that one cannot help but to shift their bias to the downside. These candlestick patterns are often traders first introduction to technical analysis. 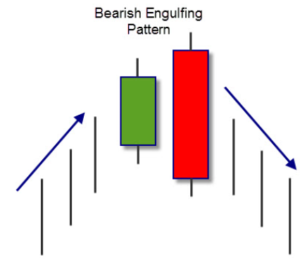 The pattern is defined as a bearish candle that “engulfs” the range of the previous day. I also like to look for a negative close and preferably a close below the previous session’s low. Here are a few pictures of bearish engulfing candles. The truth is that this pattern has been one of the most bullish (not bearish) one day signals for the SP 500 over the past 15+ years. Did you know that the day following a bearish engulfing candle actually closes higher 61.72% of the time in the SP500 futures and 65.33% of the time in SPY ETF? The day following a bullish engulfing candle only closes higher 54.05% of the time in the SP500 futures and 51.70% of the time in SPY. You tell me why they’re named how they are! Most of the time this is true but it depends on the moving average, moving average length, and the market. I recently came across a few blogs that mentioned using a short term moving average as a sign to exit long market exposure and wait for sunnier days. In reality, this sounds great; however, analyzing the data this can be an extremely misleading “truth”. Below is a chart plotting the equity curve if you would buy every close when the SP500 is BELOW the 8 period simple moving average (8SMA) and sell the next bar (repeating until above 8SMA). The second chart is if you were to buy every close when the SP500 is ABOVE the 8SMA and exit the next bar (repeating until below 8SMA). Yes, being below this moving average is actually better for long returns. The point is that these trading truths like “above a moving average is bullish” and “below a moving average is bearish” need to be quantified and tested. It is important to stop thinking trading truths can be generalized to every market, timeframe, indicator value, etc. and just verify them yourself and you’ll be much better off! Sure earnings announcements and large unexpected news announcements typically happen after market close. Does this mean we should avoid trading overnight, if possible? So many want to day trade and be flat on the close that they miss a lot of gains from the overnight session (sometimes all of them). Below you will see 30 top stocks where I breakdown their returns in the day session compared to the overnight session. The blue line signifies if you bought the open and sold the close the same day (day session) and the orange line signifies buying the close and selling on the next day’s open (simulating overnight exposure). As expected, there are no generalities in trading truths. Some stocks exhibit that most, if not all, returns come from the overnight. Don’t get me wrong there are certainly edges to be had from avoiding overnight exposure and there can also be value added by increasing overnight exposure. Again, I am just making the point to dig deep into the data and understand where the edge(s) actually live. Quick note: You can easily test overnight holds in Build Alpha by setting max hold to 1 bar and setting entry to this bar close and exit to next bar open in the settings menu. Not all trading truths are “truths”. There are many that still have value! The edge is not in these truths but in determining the difference between a truth and a “truth”. Most do not take the effort to investigate these trading axioms found in trading books, blog sites, chat rooms, etc. If I have one goal then it is to make traders realize the value in testing everything – it is something I wish I would have started earlier. It is a super power to quickly test these ideas and trade/act accordingly! I think many traders shy away from digging into the data because it requires effort and they think it will be a hard and arduous journey before they find some gold. But now I think it is increasingly easier than many may think. That’s why Build Alpha’s main goal was (and still is) to make this type of testing easier for those with no programming skills or those tired of crunching endlessly in excel. The game is changing and things like this can be easily tested now. Now trading just comes down to those who will put in the work and who won’t: this should greatly increase your odds for success if you’re part of the former group. Great write-up. The engulfing candle in interesting and I wonder how effective it is in other contracts. Equity indices have a natural upward bias as they constantly cut losers and add winners so that breaks many “rules”. The overnight move is fascinating. Eric Hunsader, @nanaexllc, has posted some great studies about this where he shows the emini is flat to lower over the trailing 12 months during the day session and the bulk of the upward movement has happened at night. Specifically the 2 a.m.. hour. The phenomenon actually exists for much longer than the trailing 12 months. The “natural upward bias” breaking “rules” really just moves the needle from 50% to ~53% and can be noted in the day following the bullish engulfing candle or better yet any random day for that matter. A one day win rate > 65% is significant. Additionally, this anomaly isn’t true for all equity indexes – all the more reason to test everything! Dave – in overnight/#3, is that the same 15 year time period as #1 and #2 for all of those charts? when you say buy below 8SMA and sell next bar? Are you selling next bar open or close? The test results over the last 15 years are within 1% of each other. I actually disagree with you about the engulfing candles. I use them all the time with good win rate. The thing with candlestick formations is that they should be traded in zones like on a trendline or support/resistance areas, and not randomly somewhere on the chart. You cannot (and definitely should not) disagree with facts as all I am doing is reporting historical data. There is nothing to disagree with. Your comment about trading in ‘zones’ is the equivalent of adding more context (or rules in a quantitative sense). Obviously adding more constraints or ‘conditions’ will change the conditional probabilities. For example, there is a simple rule that can make this engulfing pattern I presented jump to over a 70% win rate (contrary to candlestick theory) and I am sure there are other rules that can be added to make the ‘bearish candlestick’ actually bearish. This is besides the point of the article. The point is.. everything needs to be tested. You stress a need and desire to have backtested right away but still make claims that can be considered subjective (trendline, zones, etc). This is exactly the kind of trading behavior I am trying to eradicate. It would behoove you to quantify what a ‘zone’ is and then backtest your rule. Without this evidence and going through this exercise you will most likely continue to spin your wheels. Hi David, great post! I’ve been surprised by the #3 with the SPY/QQQ strong differences between day and night returns. I knew QQQ was upside biased compared to SPY but not so much. It’s more volatile but worth more investigation. The engulfing include wicks. If you look at the candles on Daily, you see alot of engulfing of the bodies but you may have a wick either on top or on top and below wich the next day didnt engulf the wicks but only the bodies. And this strategy only on the Daily that you have performed? In the article I say this, “The pattern is defined as a bearish candle that ‘engulfs’ the range of the previous day” which implies I am already including wicks in this engulfing study. In Build Alpha you can also test engulfing candles that only engulf the body (open-close range) of the previous bar as well. Also, any of the BA studies can be applied to any timeframe/bar-type, but yes the statistics referenced in this article are from daily data (as specified in the article).